Want to help with storm cleanup? Check on your elderly neighbors and call 311 about any storm damage causing road blocks, say City of Minneapolis officials. A series of storms over the Twin Cities metro and Western Wisconsin led to a weekend-long blackout for most of Minneapolis. According to Xcel’s public website and reports on KARE 11, full service may not be restored to the total area before Wednesday, June 26. While the full casualties are at present unknown, this storm, nicknamed #mnstorm on social media, has already led to the loss of home for a few unlucky area residents. Residents posting to social media via Twitter and Facebook report the blackout beginning at around 8 pm on June 21st, followed immediately by flash floods that blocked traffic in areas of north and Northeast Minneapolis. By 6 am on Monday, June 24th, Xcel reported a total area of 616,500 customers with service disrupted by the storm. Xcel practiced transparency with their restoration efforts, stating on their website that, “Repairs are then prioritized based on what will restore power to the largest number of customers most quickly.” They also prioritized by safety – areas where the most people risked electrocution, followed by hospitals and emergency services. Areas affected included the East and West Metro and parts of western Wisconsin. According to reports on social media, Saint Paul went unaffected. As of the June 24th Xcel update, Xcel hopes to restore power to all customers by noon on Wednesday. The majority of the remaining customers are located in the west metro. The Twin Cities remains under flood watch. Flash flood warnings on Solstice came paired with wind speeds up to 41 mph (66 km) and wind gusts up to 69 mph (112 km.) Total precipitation for that month came to 6.41 inches, with the average maximum in June normally coming to 2.98 inches average. ** (reporter note: I suspect I am seriously misreading this weather chart. Any more clear interpretations are very welcome.) 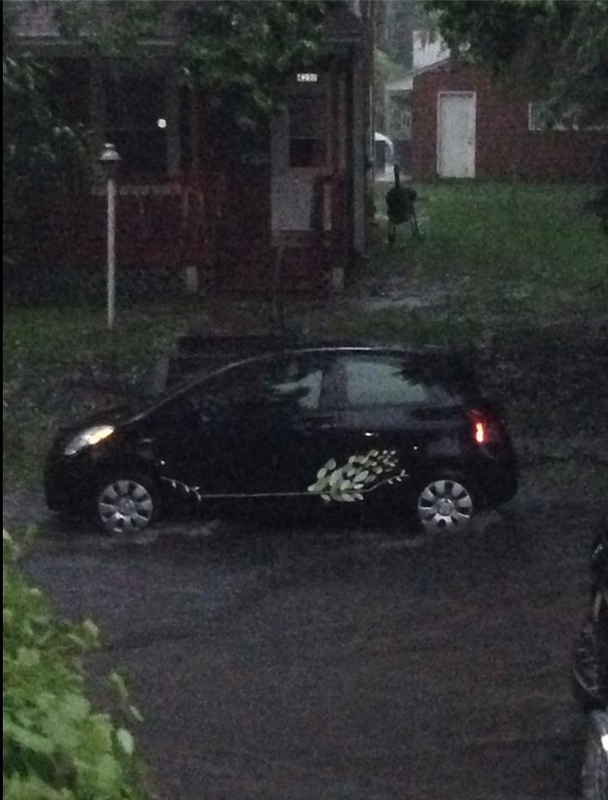 In Northeast Minneapolis, a flash flood blocked off Central Avenue Northeast around 8:15 pm. Later rising water from overflowing storm drains caused a water main to burst on Stinson Ave NE, forcing a 20 hour blockade of the street where it crosses Lowry. Thousands of homes, businesses and services were disrupted over the weekend with thousands still awaiting restoration of power. While some members of the Pagan community celebrated at Pagan Spirit Gathering in Illinois, others remained in city for summer solstice to experience the floods and blackouts firsthand. Samantha Bitner was attending a ritual at Uptown Metaphysical shop Eye of Horus when the storm came down. “I was at circle with a group I’ve never circled with before. They asked a Goddess and a Dragon to “let the sky open up” or something to that effect. Not too long after….” Both Bitner and Northeast neighborhood resident Michael Janssen report the power failure as starting at 8 pm. Lisa Spiral Besnett, a resident of Plymouth and hostess of the Priestess Show on Blogtalk radio had a tree split in half blocking her driveway and a near miss in front of her house. She counts herself as more fortunate than other area locals who face significant property loss from fallen trees. In her case, HearthStone coven and her neighbors helped her clean up the property and hook up diesel generators. She posted to her Facebook page that her power came back on on 8:00 pm Monday the 24th. Jane Hansen, partner in Eye of Horus, posted to her own Facebook page that power for the shop returned on Sunday afternoon. While Hansen noted lost sales over the weekend, she says that she and Thraicie Hawkner took the blackout as an opportunity to rearrange their shop. “We were dark from approximately Friday 8:00pm to Sunday 4:30pm. The front half of the store shifted a lot. We had planned on creating more of an oils service counter with storage space for our Spiritual Oils line, so we did that, but we also expanded our main service counter all they way down to the front of the store. Basically, smoothing out the energy flow, wherever we can.” The new layout, according to Hansen, is subtle but allows for a counter for oil sales and an improved display for local artists Paul Rucker, Beth Hansen-Buth and others. The city of Minneapolis has posted instructions for removal of tree debris and published a list of tree service contractors. The city also urges its citizens to check on their neighbors, especially those in their 80s and 90s, as well as to practice food safety with the high number of non-functioning refrigerators over the weekend.